To conclude Fitness February make some homemade ice cream!!! Today I made homemade ice cream for the first time ever! Making homemade ice cream is something that I've wanted to do since I was a kid and I finally found out how to do it and did it! The process is really easy and I just used Youtube and How Cast to instruct me on where to get started. After combining some of the ingredients you shake for what feels like FOREVER and then enjoy! My home made vanilla ice cream ! 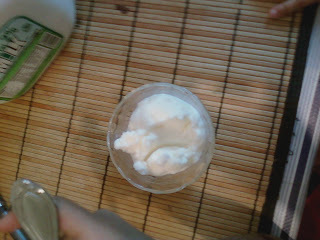 The ice cream batches that I made for the kids came out great but mine, strawberry, didn't come out too well. I think its because I doubled the ingredients and was tired and my arms hurt from all the shaking. Instead I settled for an authentic shake, since I shook it, get it... lol, with cut up strawberries in it and it was actually really good.